Today’s Mac laptops, such as the MacBook, MacBook Air, and MacBook Pro, are powered by lithium-ion batteries that last much longer than the batteries found in most PC laptops. However, over the years, all lithium-based batteries gradually lose their ability to hold a decent charge, and finally, the batteries give up completely. If you run your Mac laptop from the battery every day, you may find that it needs to be replaced sooner. This is, unfortunately, quite normal, and is true of PC laptops, iPods, and Macs. Here you can learn more about the battery in your Mac notebook, including how to optimize the battery life, troubleshoot, and have it serviced. New batteries can be purchased from the Apple Store..
All batteries are expected to function for a certain number of total and partial discharge cycles. You can see the cycle count limit by reviewing Determine battery cycle count for Mac notebooks. Measured in milliampere-hours, full charge capacity refers to the amount of power the battery is capable of containing. Full charge capacity lowers as the battery becomes depleted with usage. Remaining charge capacity represents the amount of power left in the battery. Using the computer when not connected to AC power will cause the remaining charge capacity to lower as power is depleted from the battery.. Consumed / depleted: Batteries, due to their chemical components, lose their ability to hold a charge. If the cycle count on a battery exceeds its expected limit, the battery is consumed. 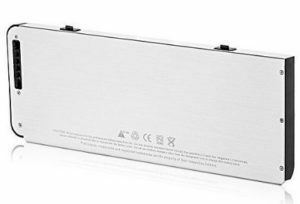 Defective Mac laptop batteries: Batteries are defective when they stop working due to a manufacturing defect, or a defect in materials or workmanship. Defective batteries are covered under Apple’s limited warranty and extended-service contracts. Battery run-time: Run-time depends on the amount of power being consumed. The run-time is affected by the full charge capacity and cycle count of a battery, as well as the load put on the system the battery is powering. Load: The amount of activity being performed. Certain power-intensive processes place a heavier load on the battery and result in a reduced run-time per charge. The status menu: The primary resource for viewing the status of the battery is the battery status menu, which shows how much charge it has, and whether it is currently charging. This menu is at the right side of the menu bar. The battery status menu updates and changes depending on your screen brightness and system workload. You may see the time remaining drop, if it updates while opening a very large file, or starting up an application. To see the health of your Mac laptop’s battery, hold the Option key and click the battery icon. Normal: The battery is functioning normally. Replace Soon: The battery is functioning normally, but holds less charge than it did when it was new. Replace Now: You can safely continue using your computer, but if its lowered charging capacity is affecting your experience, you should take it to an Apple Store or Apple Authorized Service Provider. Service Battery: You can use your Mac when it is connected to an appropriate power adapter, but you should take it to an Apple Store or Apple Authorized Service Provider as soon as possible. Stay up to date: There are many reasons to accept all updates for OS X, one of them being that the update could help with battery management. Experts also recommend accepting updates for applications, when offered. Temperature: Your battery will last much longer if you use and store your Mac laptop at room temperature. Try to avoid any extremes of temperature – hot or cold – especially for extended periods of time. Plug your laptop in: Plug in your laptop whenever possible, including when the battery is half charged. Run down the battery: Let your laptop battery run down completely about once a month. Storage of laptop: If your laptop is likely to remain unused for six months or more, switch it off when the battery is around 50 percent charged. To view your battery’s charge status in the menu bar, check the box within the Options pane of the Energy Saver – Battery panel. Contrast: Turn down your screen contrast to the lowest acceptable level using the F1 and F2 keys. Switch off AirPort: If you are not using AirPort, switch it off via the fan-shaped icon in the menu bar. Also switch off Bluetooth, if you have it on. Quit applications: Quit all programs that you are not using. Explore the settings: Open System Preferences – Energy Saver and select Battery from the Settings For menu. Then, choose Better Battery Life from the Optimization menu. Your Mac will be slightly slower, however, it will be more energy efficient. To tweak the settings further, click Show Details and then explore the Sleep and Options tabs. Note: If you are worried about the possibility that your battery might crash, download one of the free apps that will warn you in advance with an on-screen alert, by e-mail, etc., if disaster is about to strike. You can download an app from the internet, but we suggest you read the reviews before installing it. Adjusting display brightness: The screen brightness has a big impact on battery life, compared to the other settings on your Mac. You can press the F1 key or, alternatively, use Apple menu – System Preferences – Displays, to dim the screen and adjust the brightness as low as possible, while still maintaining a comfortable brightness for viewing. Graphics performance: Some models (for example, MacBook Pro 15-inch and MacBook Pro 17-inch) include two graphics processors, or GPU. You may see them mentioned as a discrete GPU and an integrated GPU. The discrete GPU provides substantial performance at the expense of high battery usage. The integrated GPU allows for optimal battery life, but in most cases, it does not have the performance of a discrete GPU. For optimal battery life, use the integrated GPU. Energy Saver in System Preferences: Energy Saver has many options to help improve the battery life on your Mac when idle. For instance, if you set your display to sleep when it is idle, the notebook will turn off the backlight, thus improving the battery life. However, some features, such as automatic graphic switching and PowerNap, are not available on all Mac notebooks or versions of OS X. Disable features and technologies that use power: Mac notebooks have integrated technologies, and some of them can have a significant effect on battery power. To save power, you can disable AirPort or Bluetooth from their menu bar icons or in System Preferences (for AirPort go to Network and for Bluetooth go to Bluetooth). This will help save power. External USB, FireWire, ThunderBolt, SD card, and Expresscard devices also draw power. You can disconnect them for optimal battery performance. To avoid the drive spinning from time to time, eject any CDs or DVDs from the integrated SuperDrive (not all Mac notebooks have these). Apps: Learn how applications can affect Mac laptop batteries’ performance. Installing updates is important to ensure optimal performance for all applications. Activity Monitor: Check Activity Monitor for any malfunctioning software processes, especially after installing software updates or a new operating system. If you have problems with your Mac’s battery life, go to the built-in diagnostics that are available on your notebook. If Apple Diagnostics tells you that your battery requires service, and cites reference code PPT004, you should confirm this issue by running Apple Diagnostics over the internet, which uses the latest diagnostic information. To do this, turn off your Mac by choosing Shut Down from the Apple menu. Press the power button to turn on your Mac, and immediately press and hold Option-D until Apple Diagnostics begins. If running Apple Diagnostics confirms an issue with the battery, contact Apple or take your computer to an Apple Authorized Service Provider or Apple Retail Store. If you are still having battery run-time issues after optimizing your computer’s performance and checking for malfunctioning software processes, test the computer in Safe Mode. Safe Mode limits the active items and allows testing your machine in a minimal environment. If you see that the battery life is better in Safe Mode, try to do further software isolation for the items disabled by Safe Mode to determine what is causing the issue. If your battery run-time is low, if your battery is not charging, or if the battery will not charge to 100%, confirm you are using the correct wattage AC power adapter. An adapter rated for a lower wattage than is required may not reliably charge the computer. For assistance identifying the proper adapter, review Find the right power adapter and cord section in the guide delivered with your Mac notebook. Additional adapter troubleshooting is available in Troubleshooting MagSafe Adapters. If the issues persist, reset the SMC. Most older Mac notebooks have removable batteries you can replace yourself. You can also contact an Apple Authorized Service Provider or Apple Retail Store for assistance in replacing a removable battery. Keep in mind that MacBook, MacBook Air, and MacBook Pro computers with built-in batteries should only have their batteries replaced by an Apple Authorized Service Provider or Apple Retail Store. Attempting to replace a built-in battery yourself could damage the device. Unfortunately, such damage is not covered by the warranty. Your Apple warranty includes replacement coverage for a defective battery. If you purchased an AppleCare Protection Plan for your Mac notebook, the company will replace the Mac laptop’s battery at no charge, if it retains less than 80 percent of its original capacity. However, if you do not have coverage, Apple will replace the battery for a fee. Getting ready to sell your old MacBook? We pay the highest price online for any Apple consumer electronics, for example, check out our prices for MacBook Pro: Sell my MacBook Pro. Have you discovered the iGotOffer blog? It’s full of helpful personal articles and links leading to some of the world’s best-known resources about Apple products, news about the consumer electronic market, its history and more. Reading our blog and our Apple Encyclopedia, you can gain valuable tips and information on many topics! Great advice is on its way to you! : iGotOffer Blog. Looking for more information about Apple batteries? The following Website may come in handy: Support.